If you like fancy style dress shirts in that come with french cuffs, Take a look at these french cuff check pattern dress shirts by Milano. 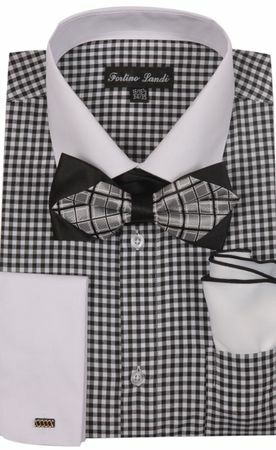 These feature white collars and french cuffs with a check design. Made of Cotton/Poly blend fabric 60/40. Comes with the bow tie set.